4 Cups (150 count ea.) Small (Approx. 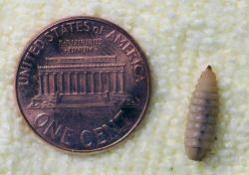 3/8") Black Soldier Fly Larvae* -- Price Includes USPS Priority Mail Shipping. BIG nutrition in a tiny package, these are the perfect feeder insect for juvenile bearded dragons, small lizards, skinks, geckos, chameleons, turtles, larger dart frogs, etc.